You can connect directly to your data and run SQL queries on your events and users stored in the deltaDNA data warehouse. You should be able to connect using any Postgres ODBC compliant tools. Some tools will come with their own built in Postgres ODBC driver, others may require you to download a driver and set-up a connection (DSN) before you can use them. The applications below marked with a (*) will require you to do this. Check out our Postgres ODBC Connection Guide for details on how to do this. Connect to your data using your favoured database manager. The following links show how to connect to your data using the following tools. OpenOffice: A Free suite of office tools. Microsoft Excel (*) : Microsoft’s flagship spreadsheet software. R : Statistical computing and graphics programming language. ChartIO : Cloud based data exploration and visualization tools. There are three types of data that can be accessed, in each case you have separate tables for your DEV and LIVE environments. Raw Event Data. This is raw event data containing all the events and parameters for your most recent events as determined by the data retention policy on your game, typically 31 days. User Metrics Data. The user metrics table contains a row of data for every player in your game, regardless of how long ago they last played. Numerous metrics that are automatically tracked and added to this table for each user but you can also define which of your event parameters are tracked as metrics in the Game Parameters Manager tool. Engage Campaigns and A/B Tests access a real-time version of this data when running player segmentation queries, the user metrics that you access through direct access are a daily snapshot of the last known state for every player, updated overnight every 24 hours. Aggregated Measure Chart Data : The remaining tables, prefixed with fact contain the aggregated data that is used to drive many of the Measure Dashboard Charts. So, you can run queries on aggregated data covering the entire history of your game. You will get much more from your data if you are familiar with the events and parameters that you are sending and how it is stored. Your events can be viewed and edited in the Event Management Tool. It is recommended that you familiarise yourself with the events that your game is sending. It can also be useful to use the Event Browser QA Tool to watch events as they arrive. The event table structure is very simple, your events are stored in a wide table with a column for each parameter that you have configured in the Game Parameters tool and at least one row for each event. Complex events can span multiple rows, more on this later.. When you use the Data Mining Tool or download any of your daily event archive files you will be accessing data in this wide table format. There are a few things worth mentioning about your events data. date ranges : Only the last 30 days of data, your Hot Data, is kept live in the data warehouse, unless you have an extended data retention policy. This can be extended on a per-game basis, please contact support if you wish to extend this for your game. empty columns : Because there is a column for every parameter that has been configured on your game, there will be many columns with no data on any given row as the parameter wasn’t relevant to the particular event. eventLevel : The example below shows 9 rows, but there are actually only 5 events here. The transaction events that you see are actually just two events, each with two nested child objects that were sent in an array. Use the eventLevel and mainEventID parameters to understand the parent / child relationships on nested events. convertedProductAmount : When you add a game to the platform you nominate a currency that you want your dashboards to display your revenue in. The productAmount and productType columns will always contain the local currency that was spent by the player and the convertedProductAmount column will contain the value converted to your nominated currency at the time of purchase. You can download the example events above if you want to take a look at some of the other columns / parmaters from this example game. The SQL Cookbook section will grow to contain a wealth of useful queries, feel free to share your own creations with us. In App Purchase Revenue in last 7 days, by Currency. ROUND(SUM(convertedProductAmount) / 100 , 2) AS "Revenue (USD)"
There are a few things you should take in to consideration when running queries against your data. Your events table stores all events from the last 30 days by default, this can be extended, please contact [email protected] for more info. 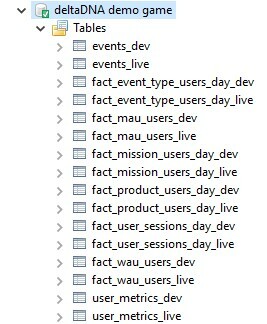 Events that contain arrays or nested objects will appear as multiple rows in you events table. The eventLevel (0 or 1) and mainEventID columns are used to link parent and child events together. An example of this would be a transaction event where the player spends real currency to buy virtual currency, this would result in three rows in the database, one with the parent transaction details and one for each of the currencies involved in the transaction. The users table contains a one row for each user in your game. The effective_date column holds a record of when the user metric was last updated. Therefore an entry with the daysPlayedInLast7Days column populated with the value 3 is telling us the number of days played in the 7 days preceding from the effective date. You cannot perform potentially destructive SQL commands on your data. The deltaDNA PostgreSQL Driver should be used for running ad hoc analytics queries and reports. It shouldn’t be used to download data extracts, your daily data archives stored on Amazon S3 are better suited to this. A limit of 10MB has been placed on SQL data transfers to prevent the SQL driver being mis-used. Your query will fail and return the following error message if it exceeds the transfer limit, “ResultSet has exceeded maximum query data transfer.”. Any SQL queries running for longer than 2 minutes will be automatically terminated. If you have a particular query that is running for too long, let us know, as we may be able to advise on optimisations to your SQL that will make it run more quickly. We do monitor the analytics database and scale the cluster to accommodate the data volumes and usage. You cannot use any of the following reserved words in your SQL queries.